Ooh la la, this lovely little pillbox hat fascinator is reminiscent of 1950s glamour. 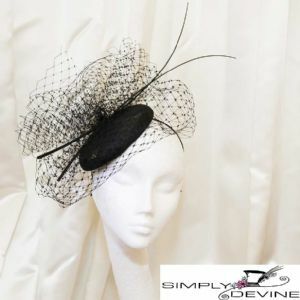 Sitting on a slim satin band, it is lavishly trimmed with net and uber sophisticated with two black quills. This is a sophisticated small piece and is versatile for all ages - young and old. It would a useful fascinator to complement a number of different colour outfits.